Created by the Russian army as a guard dog in extremely cold climates, the Black Russian Terrier temperament is hardy, lively, and brave. The Black Russian Terrier was developed in Moscow post-World War II for police work and military. They are cross between a Giant Schnauzer, Airedale, Rottweiler, and Moscow Retriever. Thanks to their origin, Black Russian Terriers – or “Blackies” – have an innate instinct to be protective – even from the time they are a year old. Despite their massive size, Black Russian Terriers are wonderful with – and protective of – children. Female Blackies are more apt to play than males, but both sexes will treat kids with respect and gentleness. Blackies are big, though, so supervision around young children is necessary as they could be knocked over or injured from a playful pup. Male Black Russian Terriers do not do well with dominant dogs. In a home, Blackies do well with dogs that are already established in the household. Or, they will get along with small or nondominant dogs. They also get along with cats, and other smaller animals, when raised with them. Black Russian Terriers love human attention and affection. In fact, they don’t like to be anywhere without you – they think they’re missing out on all the fun! Their loyalty and protective nature make them aloof towards strangers. Don’t bring a Blackie home if you cannot provide early and frequent socialization. A non-socialized Blackie may be over-protective or overly suspicious of new people. The Black Russian Terrier breed is not suitable for apartment life. They are an athletic and active breed that do best in a home with large, fenced yard. Black Russian Terriers are an intelligent breed, but they have a mind of their own. Blackies respond best to consistent, firm, yet kind training. The Black Russian Terrier gets bored easily, so do not make them repeat the same command over and over. Keep their training sessions short and fun or your Blackie will quickly find a distraction. Positive reinforcement works best with Blackies. Give them lots of praise and treats during training sessions. Black Russian Terriers have an extremely high prey drive and love to chase other animals. Leash training is important, and they should never be left off leash on walks. For assistance training your Black Russian Terrier look at Doggy Dan's The Online Dog Trainer. Are you ready to add a Black Russian Terrier to your family? 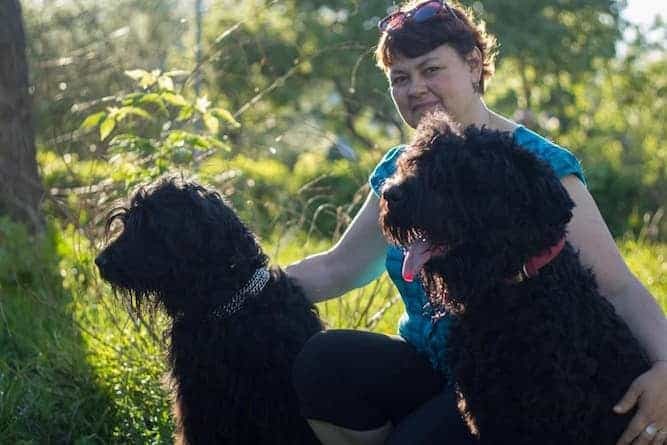 It’s time to decide whether you want to purchase a Black Russian Terrier from a breeder or adopt from a rescue organization. Consider your lifestyle when deciding whether to add a puppy or adult Blackie to your family. Black Russian Terrier puppies are a lot of work. They require patience, consistent training, and a lot of time. If you don’t think you have the time for a puppy, why not consider Black Russian Terrier adoption? Adult dogs from a rescue are typically already housetrained and know basic commands. 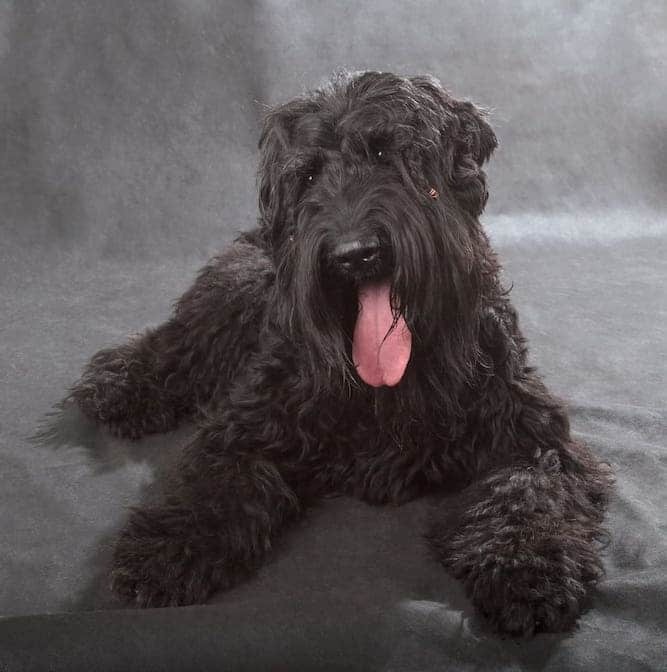 A great resource for finding the perfect Blackie is the Black Russian Terrier Club Terrier of America. They have information on breeders and rescues as well information on the breed itself. A purebred Black Russian Terrier costs between $1800 and $2500. The Black Russian Terrier price depends on bloodline, litter availability, and location. If you are looking for one with a champion bloodline, expect to pay closer to $2500. Black Russian Terrier adoption will cost anywhere from $200-$500 depending on the rescue organization. Have you decided on Black Russian Terrier adoption? Your first stop should be the Black Russian Terrier Rescue organization. While they do not have dogs available for adoption on their website, they have a waiting list of those interested in adopting a Blackie. Because the breed is rare, Black Russian Terriers in shelters are few and far between. You may have a better chance of finding a Black Russian Terrier mix at a rescue organization. To find Black Russian Terrier breeders in your area, visit the AKC Marketplace. Here, you can search for breeders with puppies available now or coming soon as well as champion bloodline breeders. When choosing a breeder, research carefully and plan visits to ones you like. Bring a list of questions about both their litter and the breed. If they are unable to answer your questions, they are not a reputable breeder. Breeders should also ask you questions about your lifestyle to determine whether you’re ready to add a Black Russian Terrier to your family. The Black Russian Terrier size is considered “giant”. Males stand between 27-30 inches while females stand between 26-29 inches tall. The Black Russian Terrier weight is between 80-130 pounds and their life expectancy is between 10-12 years. 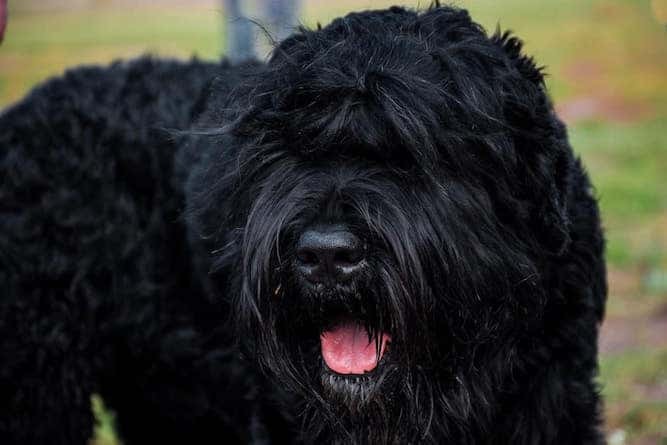 Some people compare the Black Russian Terrier vs. Bouvier but the two have different temperaments and the Blackie is larger. 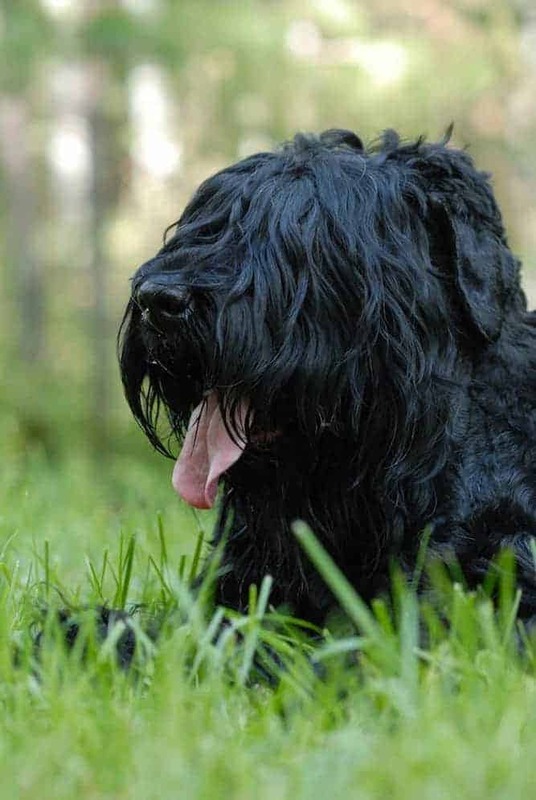 The Black Russian Terrier has – you guessed it – a black coat. But, pops of gray can be seen – even in puppies. Blackies have a double coat, where the outer one is coarse, and the undercoat is thick and soft. Black Russian Terrier grooming requires weekly brushing to prevent matting and bathes only when needed. Black Russian Terrier shedding is minimal but those with longer coats will leave small hair clumps around if they aren’t brushed enough. Note: if you agree that your Blackie's health is a top priority then definitely get The Ultimate Guide to Dog Health. Your Terrier friend will love you for it. The Black Russian Terrier is a moderately active breed and needs at least 30-40 minutes of daily exercise. Take your Blackie on a daily long walk, run, bike ride, or even swim. Black Russian Terriers can become destructive and unhappy if they don’t get enough exercise. Blackies also excel in dog sports like agility, rally, and obedience. Conclusion: Why the Black Russian Terrier? Though they can be aloof and protective, the Black Russian Terrier is calm, loyal, and adore their family. The Blackie is great with children but can be dog selective. They need a large yard and lots of exercises to avoid boredom and destructive behaviors. Black Russian Terriers are intelligent and will respond to positive reinforcement training, but they can have a mind of their own! If you’re looking for a hardy, brave, and lively breed, the Black Russian Terrier is the perfect companion. Next post: Is the Black and Tan Coonhound Temperament (Easygoing, Gentle, Trusting) Right For You? Previous post: American English Coonhound Temperament (Energetic, Active): Is Your Personality and Lifestyle A Great Match?